In the middle of the twenty-first century, war and drought still ravage Africa and millions of people are displaced and heading towards an unwelcoming Europe. Giant energy corporations battle over profits and governments struggle to provide answers to any of mankind’s problems while Jihadis run rampage over much of Northern Africa. 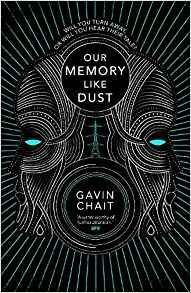 Despite all of these all-too-familiar problems forming the background of Our Memory Like Dust, Gavin Chait has not written a gritty tale of gloom and disaster but a surprisingly uplifting novel of determination and innovation.